Chrysanthemum tea is an infusion drink prepared by pouring hot water over dried chrysanthemum flowers. A popular summertime drink in China, the tea has been used in Chinese medicine to treat a variety of conditions. However, not all chrysanthemum tea benefits are supported by scientific evidence. Chrysanthemum tea is not made from tea leaves as you would expect. Instead, this infusion tea is made from flowers of the chrysanthemum plant. Chrysanthemums, or mums, are a perennial plant related to the sunflower family and are known for their bright blossoms. Some people also believe that if you combine chrysanthemum with other herbs, you may be able to treat prostate cancer, and when combined with licorice and Panax notoginseng (an ancient Chinese herb), it may treat precancerous lesions. While the health benefits of chrysanthemum tea are widely promoted, few of those benefits are supported by strong clinical evidence. Many claims about the drink are based on limited studies or personal reports regarding Chinese chrysanthemum (in a variety of forms) combined with other herbal ingredients. Some preliminary studies suggest that taking Chinese chrysanthemum and chromium in specific doses may help to treat people with newly diagnosed or poorly controlled type 2 diabetes. However, there is not enough evidence to say for sure if there is a benefit. There is also limited evidence that combining chrysanthemum with other ingredients may help to treat precancerous gastric mucosal lesions. However, experts still advise there is not enough evidence to support using chrysanthemum to treat stomach cancer or any other type of cancer. The Natural Medicines Comprehensive Database also advises that there is not enough scientific evidence to support using chrysanthemum for treatment of other conditions listed above. Chrysanthemum tea is a floral infusion and not a true tea made from leaves of the Camellia sinensis plant. As such, there is no caffeine in the beverage. It is possible to experience certain side effects if you consume chrysanthemum or handle it to prepare your tea. You may suffer from a skin rash (also called contact dermatitis), including redness, swelling, or itching. You may also experience an increased sensitivity to sunlight and an increased chance of getting a sunburn. You should not consume chrysanthemum if you are taking drugs to suppress the immune system or if you are allergic to ragweed. There is not enough evidence to know that consuming chrysanthemum over the long term is safe. To make your own chrysanthemum tea, place dried, whole chrysanthemum flowers in a cup or teapot and pour boiling water over them. Allow the flowers to steep for several minutes until the tea turns a golden yellow color. Add sugar, if desired. One ounce of dried chrysanthemum flowers makes approximately 20, 8-ounce cups of tea. The tea has a light floral aroma and a gentle sweetness. 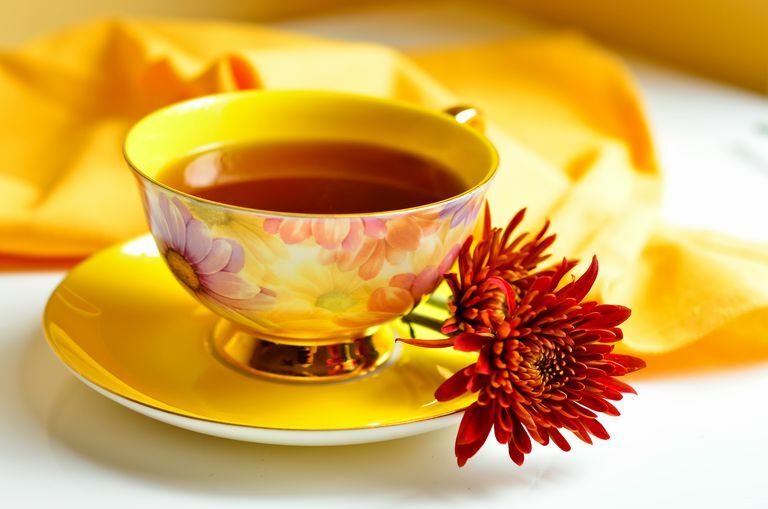 Some tea drinkers may gain relief from certain symptoms when they drink chrysanthemum tea. But it is always hard to say if they got relief from their symptoms from the tea or from other circumstances. It can be tempting to reach for a natural treatment for illness, but in some cases, the natural treatment can do more harm than good. If you are living with a health condition and prefer to get relief using an alternative treatment, talk to your healthcare provider. Many physicians and nurses are familiar with traditional Chinese treatments and may be able to guide you to the safest, most effective treatment for you. Are There Any Side Effects to Drinking Valerian Tea?